Seven thirty; time for the call to prayer and a cup of Yorkshire tea. Am off into the desert for camel riding and mint tea drinking. 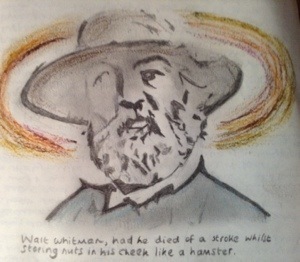 I leave you with this drawing I did of Walt Whitman, which I did looking at upside down to stimulate my synapses. He as a look of Sir Steven Fry. Watch out for them there camels. They can take your arm off.